Fiji set up a table-topping decider with France in Toulouse next Saturday after they capitalised on Canadian errors to win their Group C match 38-22 and leave the losers with remote hopes of making the play-offs. The 1987 quarter-finalists, who had try scoring winger Marika Vunibaka sent off with a minute to go after headbutting Kyle Nicholls, ran in four tries to Canada's one - leaving the Canadians winless and hoping for a big win over Namibia next week to claim the best third-placed spot. Earlier Vunibaka, a member of the sevens world championship winning team who had been selected after first choice Imanueli Tikomaimakogai went down with flu, virtually wrapped the match up with a try on the hour. Despite being covered by two Canadian defenders Vunibaka, whom coach Brad Johnstone had said it was time for him to step up and see if he was up to the bigger version of the game, escaped and ran unopposed to touch down under the posts. However it had been a dreadful error by Canadian fullback Scott Stewart which handed Fiji a try late in the first-half to help them take a confident boosting 22-16 lead at the turn. Stewart, winning his 53rd cap, went to catch a Fijian chip and completely missed it allowing Fero Lasagavibau to go clear, though he was held back by his shirt he still touched down - however, referee Ed Morrison had already awarded a penalty try. The Fijians capitalised on this sudden swing by scoring another as centre Viliame Satala swooped to touch down under the posts and suddenly Canada found themselves on the rack. 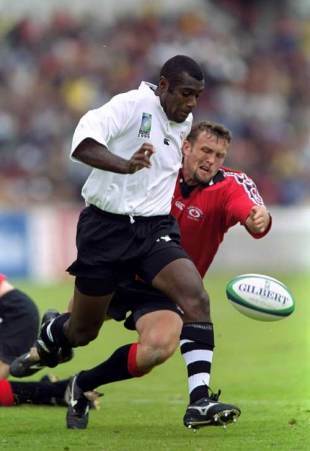 The Canadians, who beat Fiji on their way to the 1991 World Cup quarter-finals, had taken the lead five minutes into the match through a penalty try after Stewart was blatantly obstructed after chipping ahead to the Fijian try-line. Rees, who had only passed a late fitness test after twisting his ankle in last Saturday's defeat by France, extended the lead but the ever resourceful Fijians hit back with a try. Satala went over after Fiji opted to run a penalty just five metres out from the Canadian line. Fiji should have scored another one minutes later after the 27-year-old Satala burst through the Canadian midfield but with a man outside him on the overlap he wasted it by chipping ahead - Stewart cleared it into touch. Gareth Rees, the ninth highest scorer of all time, made them pay with another penalty to give the Canadians some breathing space. Boosted by this the 1991 World Cup quarter-finalists upped a gear and went desperately close to their second try when a kick-ahead by Winston Stanley was only just handled over the deadball line by Fijian fullback Alfred Uluinayau before recalled centre Kyle Nicholls got to the ball. The 32-year-old Rees, however, kicked a drop goal to reward the Canadians for their pressure but then Stewart's mistake let the 1987 quarter-finalists right back into it. Little, chosen in preference to sevens specialist Waisale Serevi at fly-half, added to the lead with a sweetly taken drop goal shortly after halftime but then missed a kickable penalty.